After the 2016 EU referendum, Blowfish Theatre made a musical about Boris Johnson and Brexit. They thought it wouldn’t last the summer. It won’t be their last mistake. Now completely revised and updated, Boris is back. 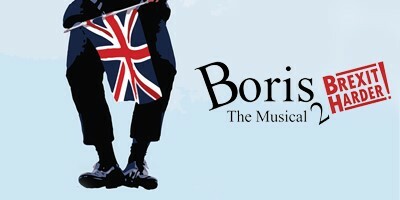 Longer, blonder, worser, it’s...Boris the Musical 2: Brexit Harder. From Eton to Brexit 2019 in song! "Makers of truly contemporary theatre... Pacy, irreverent, rude and very funny." "In the best satirical traditions of That Was The Week That Was and The Frost Report. Whilst it has some painful messages to deliver, it does so with unapologetic irreverence."